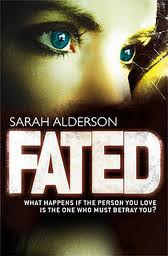 I just this minute finished Fated. I'm not quite sure what to say about it, but I'll try! There was much to like, and there were a few things I wanted more of. It is an interesting story, that's for sure. I like the idea of demon hunters. Oh wait, Hunters of the Unhuman. I like to think that there are special beings out there protecting me from evil and harm. I loved the training scenes. I wonder how I would fare in some of this training? I'm not athletic in any way, so I'm guessing not well, but a girl can dream right? I enjoyed the Hunter Lore. The more I now about a world, the better. I get to picture everything, and make up my own imagination about past, present, and future characters. I find it fascinating that author Sarah Alderson came up with this concept. What else is in her head?! I wanted more romance. You know me, I'm a romance whore. I eat it up! I love when the two main character's are friends first. Best friends. I like to see them falling in love and know why they love each other. I like to know that they have had ample time to get to know one another. Fated had more of an insta-love thing going on. I thought a little bit more time was needed for the love birds. I wanted a lot more kissing. I like kissing. So sue me! I still loved the love story, I just wanted more. Overall, it was a fun read! Interesting concept and I'm looking forward to book two! "If we could harness one of your looks Evie, we could probably do away with weapons altogether."